Hanarai Assutlanipal is a Dunmer agent who has a house in Ald'ruhn. She is secretly a sleeper agent of the Sixth House. 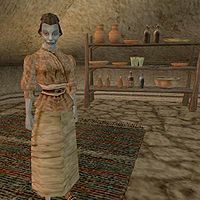 During a quest for House Redoran, you will be forced to kill her, and this will cause fellow Sixth House agent Dravasa Andrethi's to be cured of Dagoth Ur's influence over him, and will earn you a Reputation point if you talk to him afterwards. If you talk to Hanarai, she will act like a normal citzen until the Ash Statue topic is mentioned. Afterwards, she will become hostile, regardless if Dagoth Ur is dead or not. If you finish the Main Quest she will offer medium training in Short Blade and Light Armor, and minor training in Sneak. Hanarai wears a common shirt with matching skirt, belt, and shoes. She wields a chitin dagger and carries an ash statue and up to ten gold. Aside from her natural resistance to fire and the sanctuary provided by her ancestors, she knows no spells. This page was last modified on 10 June 2014, at 18:36.